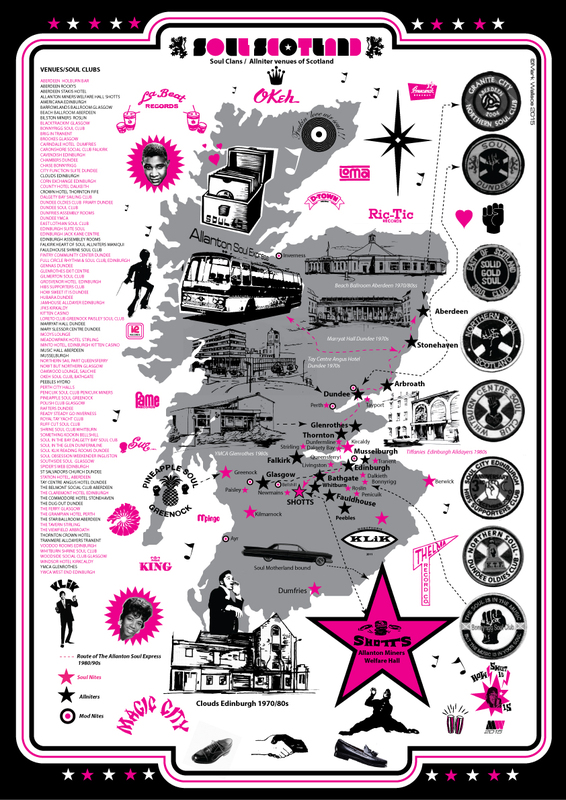 This Soul Map of Scotland is a tribute to Shotts Northern Soul All-niters held at Allanton Miners Welfare Hall Lanarkshire from 1987-1991. Founded by Jim O’Hara, Brian Welsh (RIP) and John Nielson. The Road/Journey is integral to Northern Soul. I thought a map could convey that pilgrimage. We used to join the Aberdeen crew when their bus came down from up North on route to Shotts, the bus was packed and smoky with Northern blaring through coach speaker’s with the banter in full swing, it was pure magic. I still love all those dodgy roadside Little Chef establishments you pass to on the motorways – they always raise a smile and a tune. Available as a Tea Towel soon!